This coif is embroidered in coloured silks, embellished with precious metal threads and spangles (sequins). 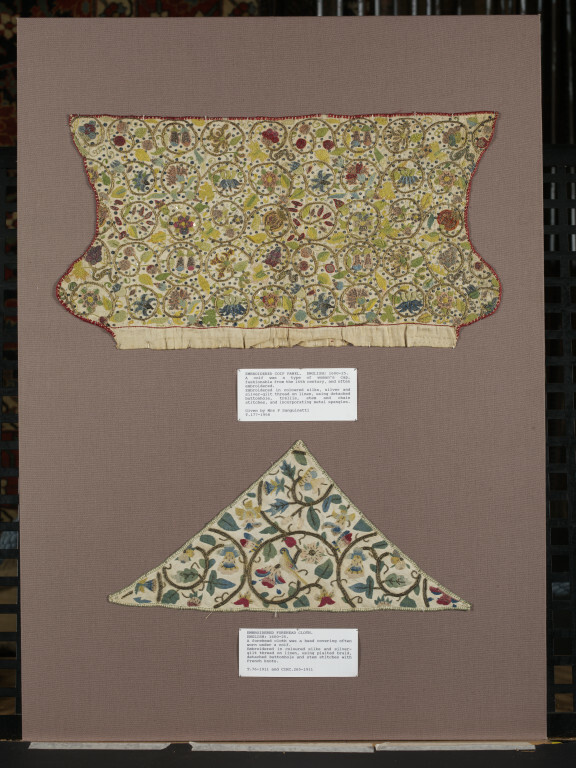 The pattern of scrolling stems bearing flowers and fruits is typical of embroidery design in the late 16th and early 17th centuries. 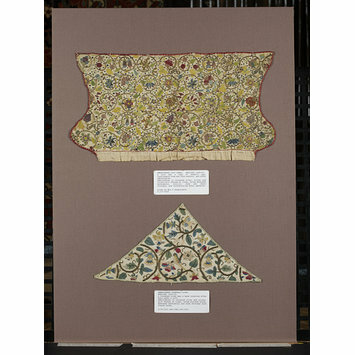 A linen coif embroidered with silk thread in shades of blue, green, pink, red and yellow in stem and detached needlepoint filling stitches, and silver and silver-gilt threads in plaited braid stitch and couching. The pattern comprises silver-gilt scrolling stems bearing borage, carnation, roses, honesuckle, grapes, columbine, fox-glove, pansies, pomegranate, strawberries and rosehips; the ground powdered with silver spangles. The coif has cheek pieces and a widow's peak. The front and top edges are worked with buttonhole stitch in red silk. The top seam, crown gathers and lower casing have been unpicked at a later date.